Several members of the Carolina Bird Club converged on Huntington Beach State Park in South Carolina on Saturday September 10 for a field trip. While the beautiful weather was not overly conducive to seeing numbers of passerine migrants, shorebirds put on a decent show, the waders were nothing less than spectacular, a shark made an appearance, and 92 species were tallied for the day. Highlights from the trip include the amazing sight of a staggering number of waders in Mullet Pond early in the morning. By mid-morning most of the birds departed and a visitor might wonder what all the fuss was about, but a few hours earlier hundreds and hundreds of herons, egrets, and other waders virtually covered this small impoundment in white. 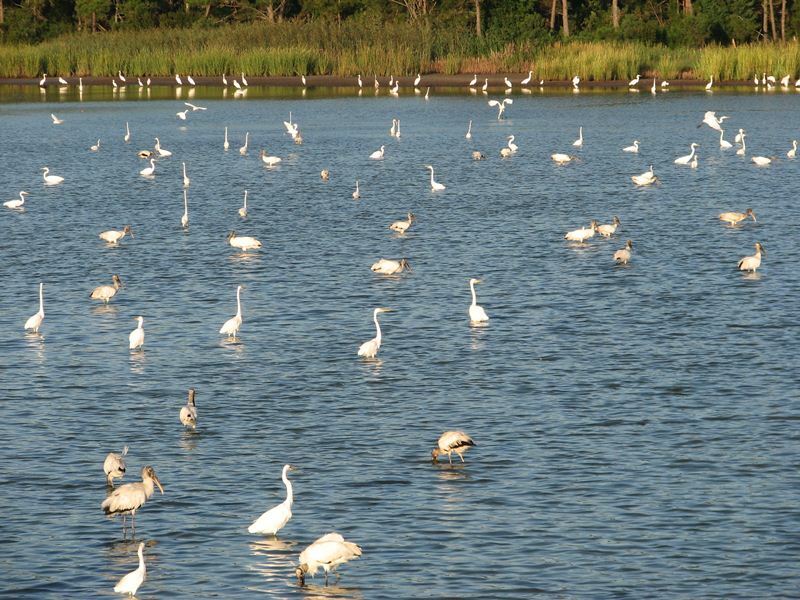 Hundreds of herons, egrets, and WOOD STORKS mixed with a young REDDISH EGRET, 2 pink ROSEATE SPOONBILLS, and several species of tern to feed on a significant concentration of small fish. Successful catches were often followed by gangs of hungry waders chasing the lucky fisherman. Who knew Wood Storks were so bullyish? We even watched one stare down an alligator for a treasured roosting spot... and win! Shorebirds of various sizes and types padded around the muddy margins of Mullet, including an uncommon "inland" sighting of RED KNOT and the more expected STILT SANDPIPER and PECTORAL SANDPIPERS among the more common and expected species. Plenty of BLACK TERNS patrolled overhead, and recently arrived BLUE WINGED TEAL formed the vanguard of the dabblers that will take over the pond come winter. The slog to the jetty was generally unremarkable except for a 3–4 foot shark seen and watched for 5–10 minutes as it pursued a school of mullet that could be seen each time a wave crested.